I had not really expected to write an update to this trial at this time of year, this is because I had already thought that Rosa Millie had passed the moment when she would flower. Plantify sent me this rose to trial in March, which is a little later than when I would usually plant a rose but before the main growth period so I was not too worried about it settling in. It grew really quite well this year, not the largest of roses I've ever seen and for most of the year no buds at all. This was a little disappointing but then I always think that roses need a year to really settle in. I take no real notice of their first year of growth in the garden or how much they flower as the second and further years are always better. Of course if they start flowering well then this is very good news and bodes well for the future, but I do not lose heart in year one. So suddenly, mid-October I realize there are buds (yes plural) on this rose. The next time I look one is open so I quickly photographed it before the rain and wind destroyed it. I also checked it for scent as there is little point in a rose that has no scent (apart from the ones that I decide are ok without it). This rose has a good scent, sort of rosey-scent, which is no bad thing. 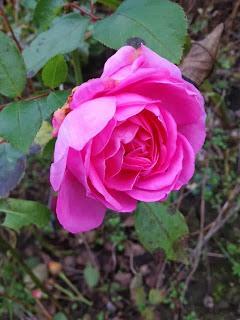 All in all I am happy with this rose, it is a nice clear pink and has grown reasonably well so far. I hope for good things from it next year. The other plants in the trial are all growing well, the Aster x frikartii 'Monch' remains one of my favorite at the moment because it has flowered so well this year. It has been a real asset in the garden. The Anemone x hybrida 'Robustissima' and Geranium 'Tanya Rendall' have both flowered well too. I can honestly say that all the plants I have received have settled in and performed. I am just waiting for the Helleborus x hybridus 'Red Lady' to flower and then I think the full cycle of the trial is complete.